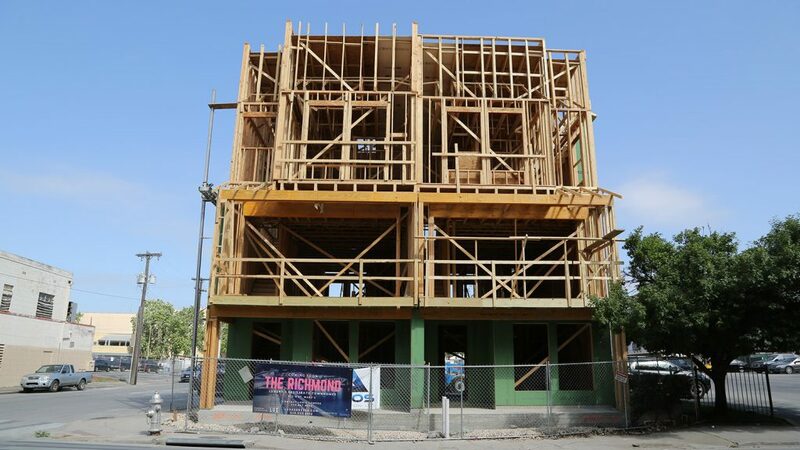 Construction has started on The Richmond, a five-unit townhome development near the Tobin Center for the Performing Arts that may be a harbinger for more growth in that area of downtown. The $2.6 million project at 825 N. St. Mary’s St. is due for completion in August, developer Mitch McManus said. Each of the three-bedroom, three-bathroom units will be sold for an amount “north of $600,000,” said McManus, who developed the 17-unit Casa Blanca Lofts near the Pearl in recent years. The 2,000-square-foot units will also include a two-car garage. The Richmond is due to receive an incentive package from the Center City Housing Incentive Policy (CCHIP) worth an estimated $244,687—$201,000 of which is a tax rebate over 15 years. “If it weren’t for CCHIP, this wouldn’t have been built,” McManus said. McManus said it’s going to be harder and harder for developers to make projects work financially because of the revisions to CCHIP the City Council passed in December. The Richmond is in a pocket of downtown that’s surrounded by the medical district, Central Library, Southwest School of Art, and the Tobin Center for the Performing Arts. A block north on North St. Mary’s Street, Houston firm DC Partners is building the 20-story Arts Residences and Thompson San Antonio hotel on Lexington Avenue. The Southwest School of Art has long had plans to develop the parcels it owns across from Navarro Street, but it’s not ready to announce specifics just yet, president Paula Owen said. My wife and I were really looking at these as I work for USAA and was relocated downtown last summer. I’ve been with the company for 10+ years earning in the mid 100k’s and there is no way we could afford $600k+ to live in 2,000 sqft here. Even new development in King William is cheaper!!! I love how my employer is moving 1,500+ jobs downtown and even employees making 100k+ can’t afford to own more than a shoebox downtown. There are housing options near to USAA downtown that you can go for. Esp in a neighborhood that is revitalizing/gentrifying. Tobin Hill, Dignowity Hill, Government Hill, Lavaca, Beacon Hill. I don’t think he or anyone called it affordable.